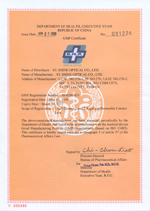 When medical devices are imported into a U.S. market, they must be approved by Food and Drug Administration (FDA) in advance. 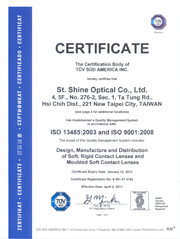 St.Shine intends to develop the market in U.S. through Optical Connection Inc.. 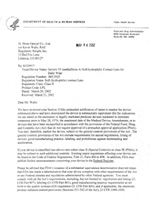 The corporation submitted Section 510(k) premarket notification to FDA on March 21, 2002. 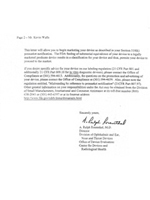 After FDA review, the clearance letter was received on May 6, 2002, allowing us to begin ISO 13485 & marketing lenses in United States. 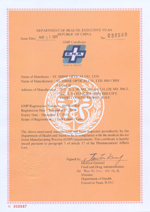 prepared aggressively to meet the medical device regulation for "Good Manufacturing Practice." 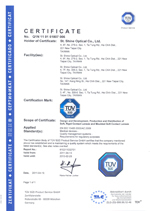 The quality management system for medical devices imported to Canada is required to conform to the regulatory requirements of CMDCAS by Health Canada. 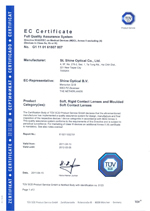 In order to meet the Canadian regulatory requirements to develop the local market, St.Shine has obtained the certificate of ISO 13485: 2003 under CMDCAS according to the plan and also continuously obtained the certificate of ISO 9001:2000 in the meantime.